A series of novel NaYSnWO7: Eu3+ red-emitting phosphors were prepared via conventional solid-state reaction. The synthesized samples were characterized by X-ray diffraction (XRD), Rietveld refinement, field emission scanning electron microscope, UV–Vis–NIR spectrophotometer (UV–Vis) and Photoluminescence spectrometer to analysis crystal structure, elemental content, energy band and photoluminescence properties and so on. Under the 395 nm excitation, NaYSnWO7: Eu3+ phosphors showed the red emission of Eu3+ ions corresponding to 5D0 → 7F2 transition in 4f–4f orbit. The optimal concentration of Eu3+-doped ions was determined to be 0.30 mol and the non-radiative energy transfer of NaYSnWO7: Eu3+ was found to be electrostatic multipole interaction. In addition, the Judd–Ofelt theory was used to discuss the influence of the replaced position of Eu3+ ions on the luminescent performance. The prepared samples exhibited good color coordinates (0.648, 0.3488), high color purity (90.80%) as well as better quantum efficiency (70.09%). 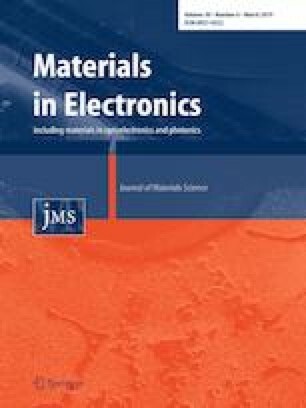 The results suggested that the Eu3+-doped NaYSnWO7 red-emitting phosphors were suitable for applications in near-ultraviolet pumped white light-emitting diodes. This work is Supported by the Program for Tackling Key Problems of Science and Technology Department of Shaanxi province (No. 2015GY173).